Want to be on the winning side of a 100% sure thing? Try this! Very few statements can be made with 100% certainty in life or, more importantly, in fly fishing. But, this is one: Big Fish Eat Little Fish! This basic statement of the prey-predator relationship is well known by saltwater fly anglers. However, for freshwater fly fishers, especially those who target trout, the fact that Big Trout Eat Little Fish appears to have retreated in memory. In this day and age of matching the hatch, precise imitations of mayflies, caddis flies and stoneflies and the use of smaller and smaller hooks, even down to size 32 for certain patterns, the casting of streamers and other baitfish imitations has lost popularity. Nevertheless, as long as there are fish, the larger ones will eat the smaller ones. 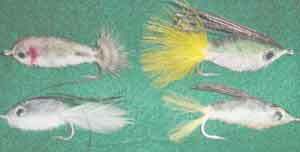 Fly tiers have used feathers and deer tails to fashion the deadly lures that we know as streamers. However, synthetic materials are now freely substituted for the natural materials or combined with natural materials to produce freshwater and saltwater streamers that are extremely effective for attracting game fish. One terrific new synthetic material is known as Body-Fur. 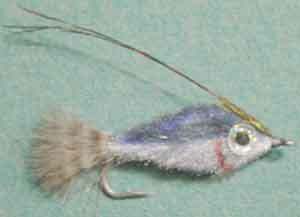 Body-Fur can make it very easy to tie quick and realistic imitations for both saltwater and freshwater patterns. 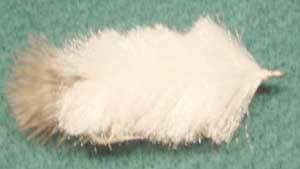 The fibers of Body-Fur are attached to a core thread along with small bits of holographic flash. 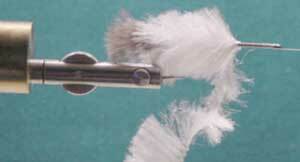 Once attached to the hook, the Body-Fur is wrapped in tight loops much like wrapping a hackle on a dry fly. Hook: Long shank [3x-6x]. This is dependent upon the size of the imitation you want to tie. Hooks that I have used and which have performed very well are the Daiichi X-Point X472 or Tiemco 911S for saltwater use, and Tiemco 5263 or 300 for freshwater patterns. Thread: White, 3/0 to 6/0. Tail: Grizzly Marabou. Other materials can be used depending on the pattern you are tying. I have used yellow marabou and yellow deer tail, tied in a split fashion, to duplicate the yellowish tail of certain sardines in the Caribbean. Body: White Body-Fur. Eyes: Hologram Eyes, applied with Zap Gel. Gill Simulation [optional]: Red Prismacolor Pen. Over Wing [optional]: Peacock Herl. Step 1: After tying on thread, attach tail materials. Wind thread forward to eye, and then back to the tail. Tie two half hitches. Step 2: Tie-in end of Body-Fur. Wind thread forward to about 1/8th inch behind the eye and tie two half hitches. Wind Body-Fur forward, carefully placing one wrap in front of the other. Use left hand to keep fibers standing straight up or lying slightly back towards bend. Step 3: Tie off Body-Fur behind eye, whip finish and apply head cement. Let dry. 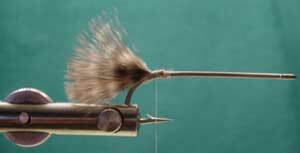 Step 4: Remove the fly from the vise, hold the hook by the bend with the fingers of your left hand and "flick" the eye of the hook with the fingernail of the middle finger on your right hand in order to "fluff out" the Body-Fur. Step 5: With a sharp scissors, shape the fly to the desired body type desired. Periodically during the shaping process re-fluff and stroke the Body-Fur. Continue shaping the fly until you are satisfied with the shape. Give the fly a few final flicks in order to remove any small material clippings before using the pens. Step 6: Using the Prismacolor Pens, apply the appropriate markings for the fish being imitated. [See the accompanying photos for some ideas.] In general, fish usually are darker on top half and lighter on the bottom half of their bodies. Use colored photographs of the fish you want to imitate for greater accuracy. Step 7: When the ink is dry, affix the hologram eyes with Zap Gel. I generally use the largest eyes possible for the pattern since I believe they provide either a trigger response or a target for the predator species. Step 8 [Optional]: Add red markings for simulated gills. 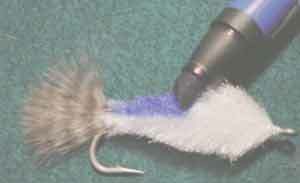 Step 9 [Optional]: Tie in peacock herl behind the eye of the hook and let it trail toward the rear as a type of over wing. The photograph shows the peacock herl sticking up at an odd angle. This is to be expected when dry. However, when wet it flows along the back and moves a great deal during the retrieve. Capt. Juan Torruella and Capt. Omar Orraca, two outstanding and productive guides in the San Juan, Puerto Rico area, believe that this over wing greatly increases the chances for a hook-up with Tarpon. Based upon their experience and mine, I know this is true. Tip: For maximum action be sure to use a loop knot such as the Duncan Loop, the Perfection Loop or the Non-Slip Mono Knot to tie on your Body-Fur creation. The patterns you can tie with Body-Fur can range from two-inch freshwater flies to six-inch saltwater varieties. Although Body-Fur is manufactured in many colors, white is the most versatile since it can be colored by Prismacolor pens exactly as you wish. Joe Endy, a master fly-tier at the TCO Fly Shop in Reading, Pennsylvania, uses Body-Fur as a skilled artist uses a blank canvas. With a wide variety of colors, Joe has created incredibly realistic and effective flies that regularly catch brown, brook and rainbow trout, tarpon, snook, ladyfish, horse-eye jacks, salmon, steelhead, and jack crevalles. Because large trout, especially large brown trout, are not only territorial but cannibalistic as well, a Body-Fur fly drifted into a resting or feeding lie can produce a trout of a lifetime. Make some flies that imitate juvenile brown, brook or rainbow trout or other baitfish that live in your area and let the large trout's natural instincts work to your advantage. In saltwater fishing, find out the type of baitfish in the area you are going to fish and duplicate them with a Body-Fur pattern. Besides having a fly pattern that gives you plenty of action with a wide variety of freshwater and saltwater fish, you also will soon believe in a Fly Fishing Certainty -- Big Fish Eat Little Fish!! !